Ready to treat your yard to some color this fall? Any yard or landscape can benefit from having some color thrown in to it somewhere. An accent plant (or twenty!) will get the attention of anybody who sets their eyes on it. If you choose the right plant or tree, you might even catch the attention of some pollen and nectar-loving insects that will be happy to enjoy your yard with you! Check out these five great flowering trees and plants you can pick for your yard. 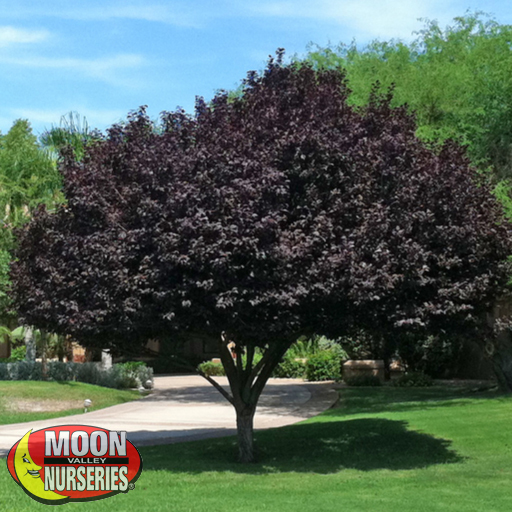 These versatile trees are one of the best flowering trees for Arizona and are incredibly colorful when in bloom. 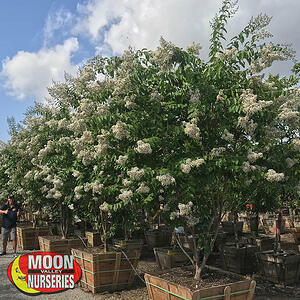 The Crape Myrtle tree flowers into shades of white, red, purple, and pink that will help decorate your yard in an accent of colors. These trees are not only drought-tolerant, but they love the heat! When the high temps arrive, get ready for your yard to be showing off the beautiful shades of color. 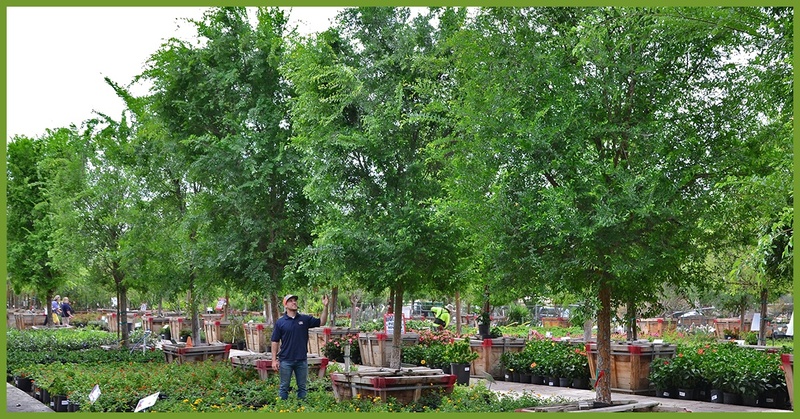 These small to medium trees offer amazingly reliable bloom cycles so we can enjoy the show from spring through fall! Even when the flowers are not in bloom, the multi-trunk structure with grey to light brown spotted bark are still impressive to the eye. The Vitex, also known as the Chaste Tree, is a favorite flowering option for its unique purple blooms on long points that form at every growth tip during the late spring and into the summer. 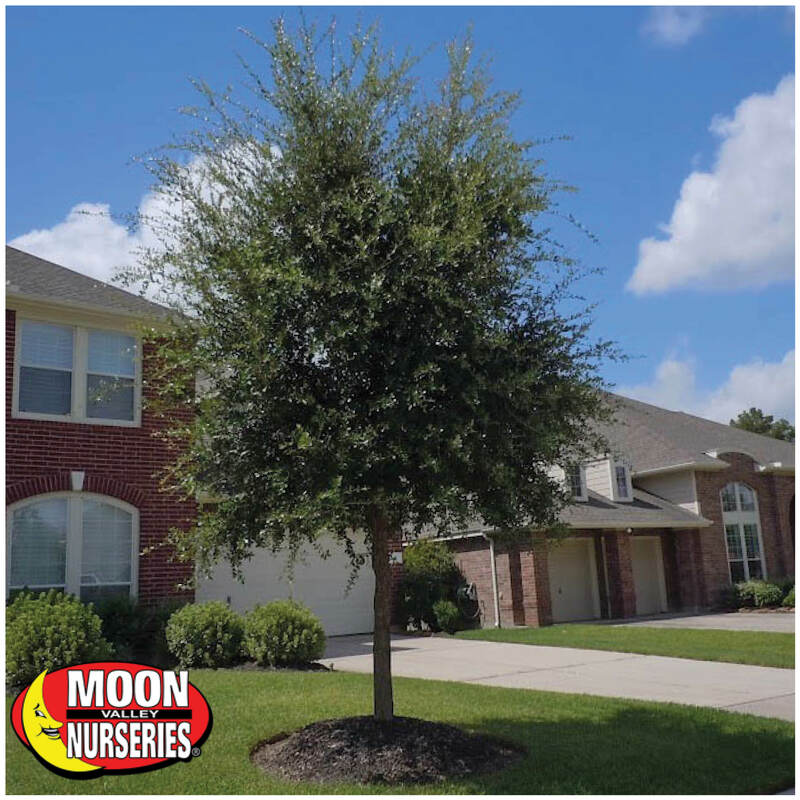 This fast-growing, small to medium sized tree is a great choice to add color to a garden or for patio use. The flowering spikes on the Vitex tree are a favorite for our pollinating friends like butterflies and hummingbirds. In addition to the stunning flowers, the trunk of the tree, often and unfortunately overlooked, has a twisted and tangled growth pattern that gives this tree a majestic appearance in any yard or landscape. 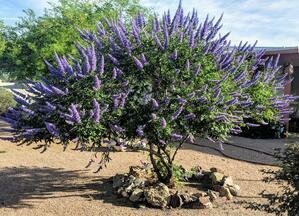 The Vitex tree needs full sun and low to moderate water, which makes it perfect for our desert region. The Tipu tree is one of the best trees you can plant if you’re looking to add shade in your yard and here’s why! 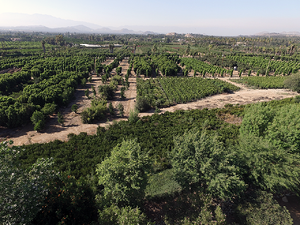 These trees grow into medium to large sizes with a high canopy and do well in our intense desert heat. They would be perfect planted along the street, in the lawn, or on the patio. 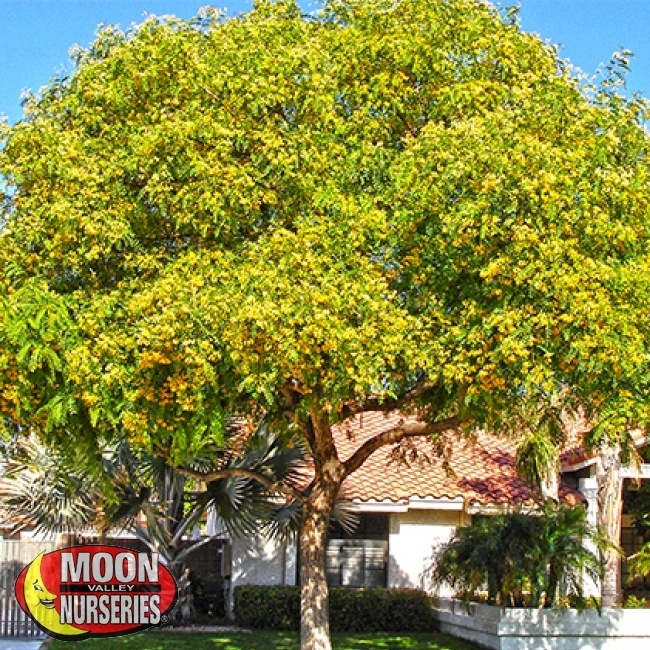 Another great feature of this tree is that it can produce a lush layer of golden blooms in the spring through the summer. Tipu trees also offer thick foliage that feature bright bluish-green hues. You might also get the attention of your neighborhood butterflies with the abundance of nectar that this tree offers. All these features will enhance the look of any landscape. A Tipu is a convenient tree for a wide variety of landscape designs! So, kick back, relax under the shade coverage, and enjoy the vibrant blooms that they bring every year. The Hibiscus shrub is a very well-known plant, even to people who have no experience with plants or landscaping. These medium to large growing shrubs are just that impressive! They bloom large bright tropical flowers with colors such as white, yellow, red, orange, and purple (just to name a few!). The beautiful flowers give off an even brighter look thanks to the full, dark foliage that surrounds them. They thrive in partial sun but can build up strength to full sun quickly. Hibiscus shrubs can be planted as a hedge, a colorful accent piece, or in a pot. No matter how you plant them, with well-drained soil, your hibiscus will be good to go! 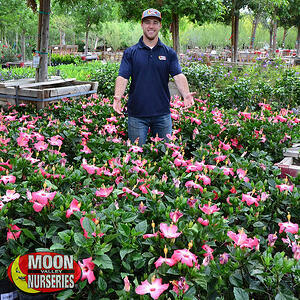 Fertilized monthly from March through September, these plants will have the best growth and a productive blooming season. 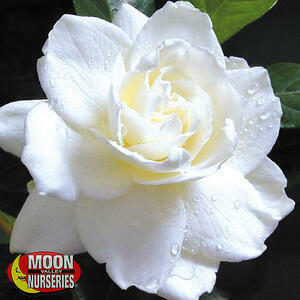 The gardenia shrubs are well-known to most people. Some know them from their sweet fragrance and can sniff them out before they even see the plant. Others know them from the large white flowers that cover the plant. Either way, this plant is quite impressive! Gardenias grow into a low to medium sized mounding shrub. 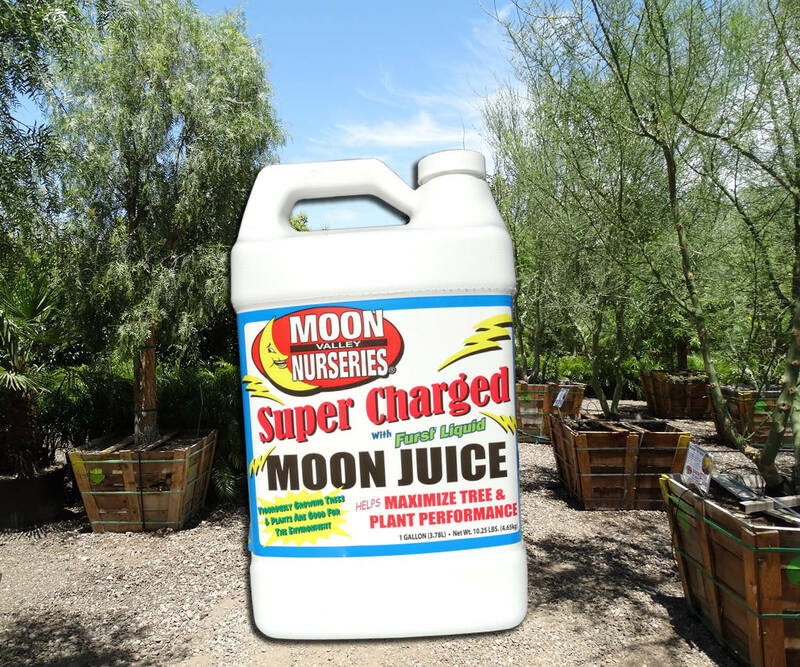 They do best with partial to full sun exposure, which works out well for Arizona gardenia enthusiasts. They like a well-drained soil, which will help keep the roots from getting too damp. Even without the flowers, the bright green leaves create a picture-perfect shrub that could easily be used like a hedge. But of course, the flowers are the main event for any type of Gardenia. The Everblooming gardenia flowers from late spring through the fall and adds a classic feel to the landscape. The upcoming fall season is the ideal time to plant. 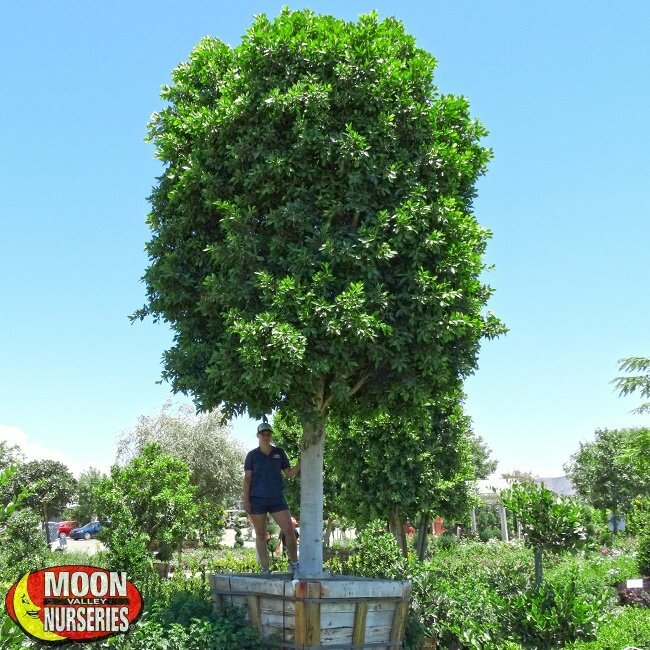 If you have any questions regarding any of these beautiful trees or plants, be sure to contact one of our nursery experts at any of our Moon Valley Nursery locations and ask them about our FREE professional planting services. It’s summertime, and while it’s hot and dry, some drought-tolerant evergreen trees can keep their good looks all summer long. These trees are some of the best evergreens for summer because they can add a splash of color to our arid environment. Of course, we could always use a shady spot in our landscape. Shade trees can provide relief from the blistering sunlight. The great news is that many of these drought-tolerant evergreens also offer plenty of shade. 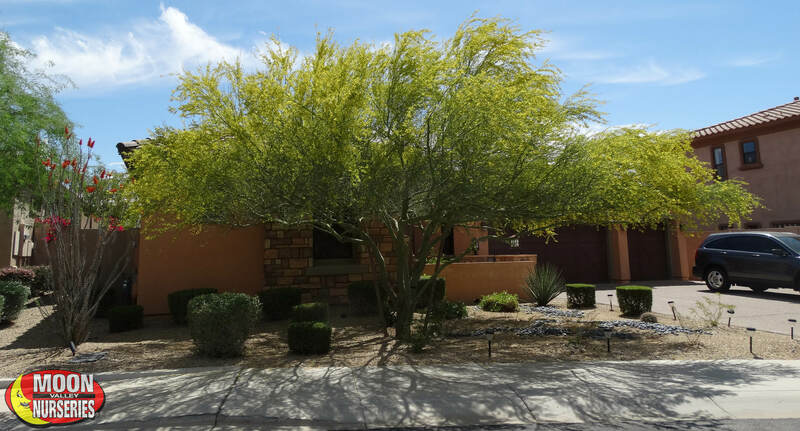 Evergreen trees with low-water usage requirements are always going to be welcome in Phoenix. 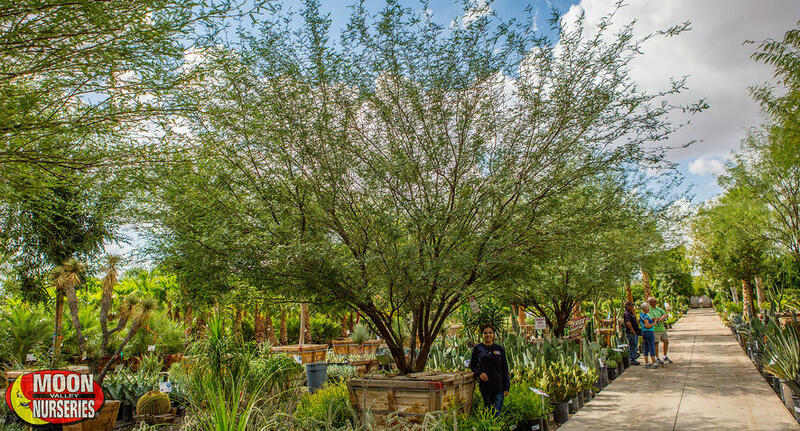 Growing drought-tolerant trees is an excellent way to make your landscape more resistant to dry weather. These trees can stand up to heat waves and handle any water restrictions. Plus, these evergreens are sure to be a beautiful addition to your yard. 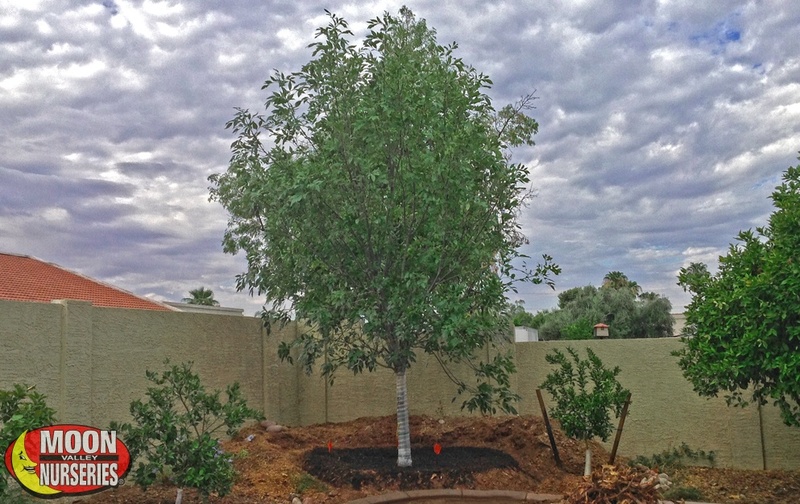 We custom-grow the best trees and plants in our local climate so that they will thrive in your landscape. We have the biggest trees in the smallest boxes so it cannot be any easier to have an instant landscape. 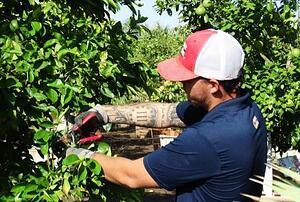 Here are five of our best evergreens for summertime in Arizona. Tipu (Tipuana tipu): Once established, these drought-tolerant beauties provide a massive amount of shade to your landscape. This colorful flowering tree thrives in intense desert heat and adds a tropical look to any scene. 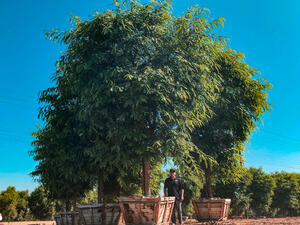 Yep, Tipu trees are tropical looking, so we can bring the calming vibe of the tropics to our arid Phoenix landscape. When the sun is in full-force, we can find some relief under its high canopy of feathery, bright bluish-green foliage. Late spring brings the arrival of the golden blooms that has made Tipuana tipu trees famous. 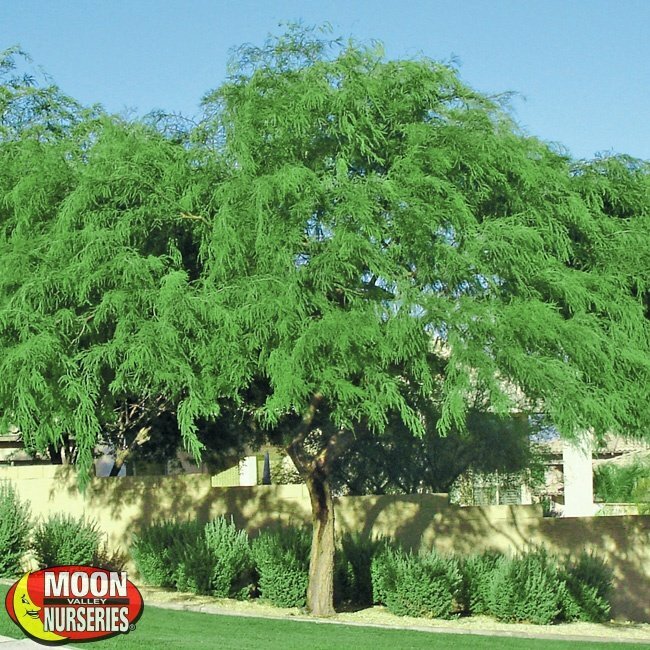 Chilean Mesquite (Prosopis chilensis): These heat-loving, drought-tolerant trees are a superb addition to any dry rock garden or water-wise landscape. They are perfect for the summertime as they can provide light filtered shade. And, while they are the perfect tree for a drought-resistant garden, they are also ideal for adding tropical flair to any landscape. Plant them in natural groupings to create a privacy screen or as a single beautiful specimen for the front yard or back patio. 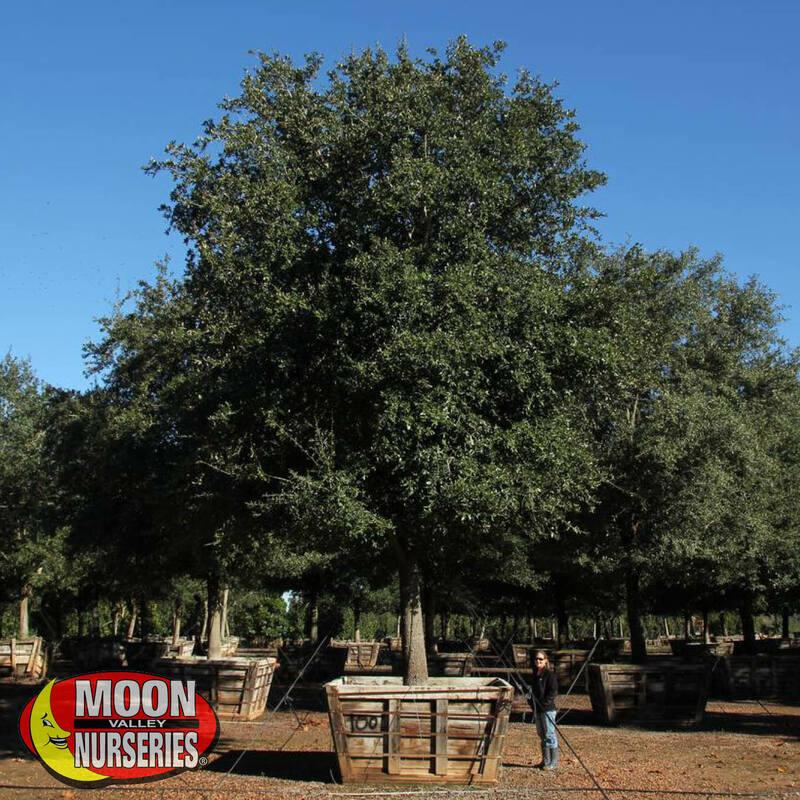 Live Oak (Quercus virginiana): You want shade, look no further than a beautiful Live Oak tree! These summertime favorites are evergreen and feature a spreading canopy that can block harsh sunlight. These long-lived trees are just waiting to be explored. Enjoy the sight of their glossy, dark green leaves for generations to come. This is a tree the entire family will love. Attach a tire swing or just rest under the shade provided by this famous evergreen tree. 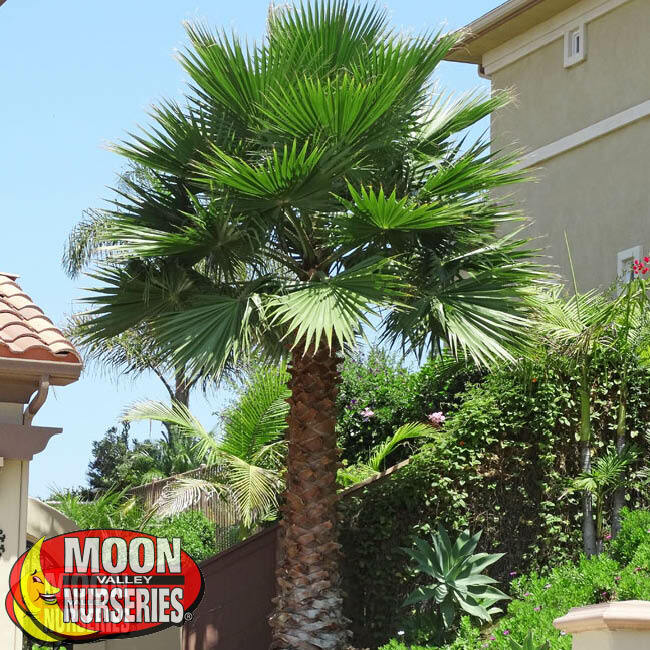 Mexican Fan Palm (Washingtonia robusta): The Mexican Fan Palm is the classic tall and slender palm often seen lining streets and avenues across the Southwest. Plant them in groupings to create an oasis or create an impressive landscape scene lining them up along long driveways. 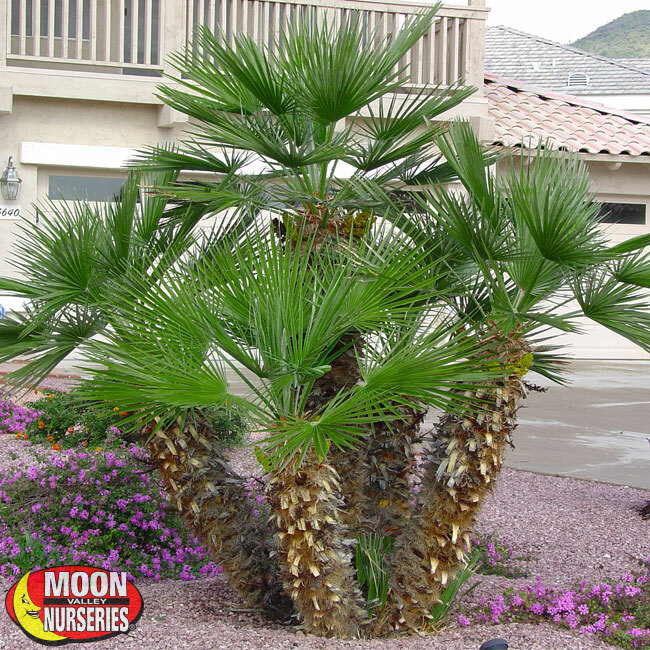 Once established, they have minimal watering needs, so they are an excellent water-wise tree for summertime in Arizona. Their large, fan-shaped, deep green fronds and slender form add a tropical atmosphere to any landscape. This evergreen also looks great against very tall buildings, helping to soften oppressive walls. Mediterranean Fan Palm (Chamaerops humilis): These are the hardiest of all palms, so they can easily handle the Arizona summer. We like to plant them poolside because their slow growth rates mean that they will rarely outgrow their space. These are heat-loving palms that do well in the reflected heat and glare around swimming pools and spas. These evergreens are water-wise, so once established, they have little watering needs. We like to use them as a focal point in a tropical garden or in a group. Are you looking to create privacy? We can use Mediterranean Fan Palms to create a tropical hedge that can block unwanted views. Plus, these palms can be used as a windbreak, too. We Do the Planting in the Summertime! It’s hot outside. Here's the good news - we do the landscape work, such as the digging and planting, even in the blazing hot summer days! That’s right. With professional planting services, you don’t have to lift a finger. In fact, you can stay in your air-conditioned home, call us, and allow our nursery pros to select the perfect evergreen trees of summer for you! 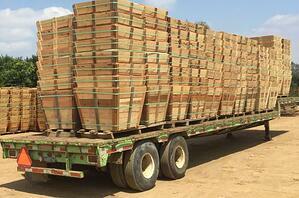 We deliver and plant the trees that are beautiful all year long. We make it easy to create the landscape you have always wanted. 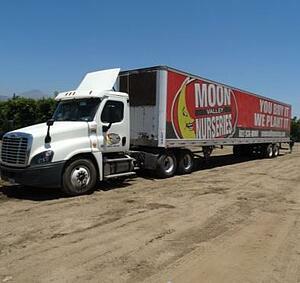 Call us and place your order or visit us, it’s all good! 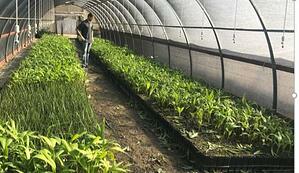 With spring already here and summer on its way, we want to keep our yard growing healthy. 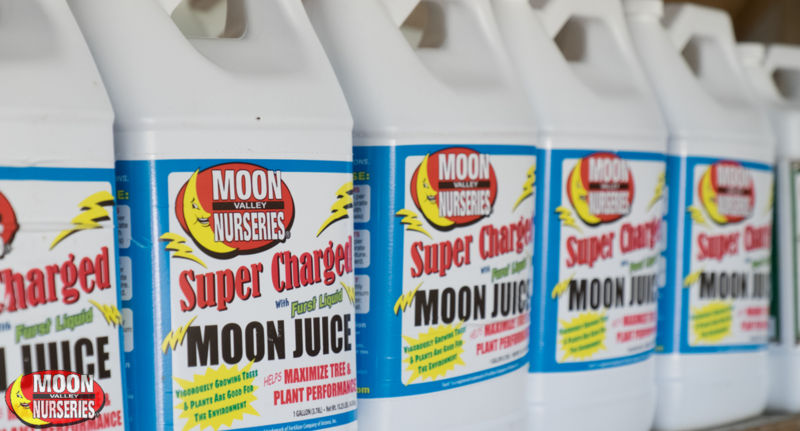 Now is the time of year when everything on your landscape will need the essential micro and macro-nutrients to help them thrive all year long in our native soils. 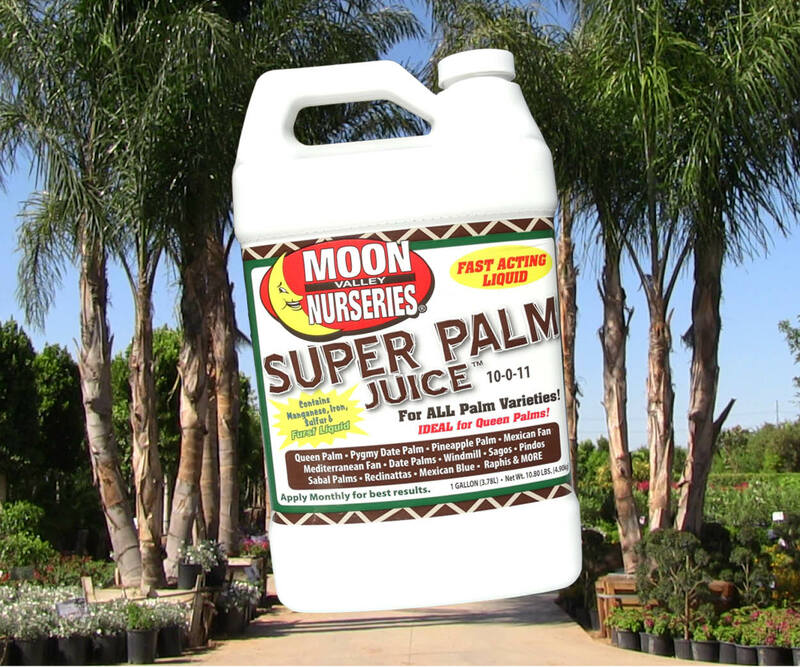 It doesn't matter what types of plants or trees you have on your landscape as palm trees, desert trees, tropical plants, fruit and citrus, shrubs, and evergreen trees all need these nutrients to grow healthy and strong. 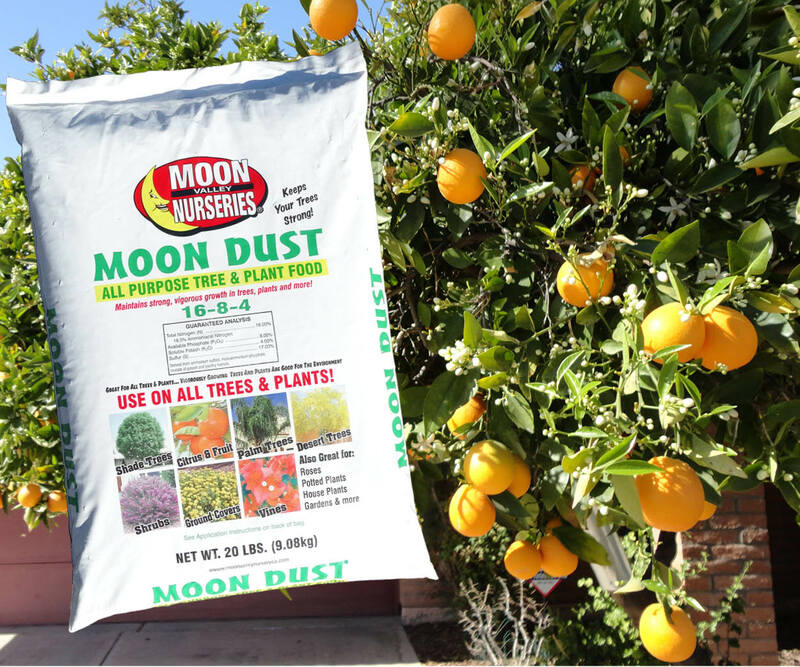 Remember to fertilize all your trees and plants monthly from now all the way through October. 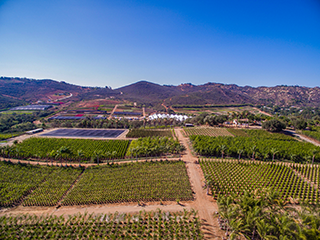 We know your landscape is an important investment for your home and family, and that’s why we’re always here to help – feel free to visit or call our nursery with any of your questions. Neglected trees are the most common cause of death, and healthy trees will withstand the elements much better. Taking just a few moments once a month to feed your trees is the easiest way to protect your investment…you wouldn’t let your pet starve, so why let your trees and plants? Click here to map a nursery location near you. This is the time that we are looking to revamp our yards and start big landscaping projects. And, most people think that they need to start with the sod and work up. Well, there’s a better way. Trees first, before sod! Sure, you might be tired of looking at dirt or patchy grass, wishing to see greenness wherever you look. But trees and plants are the key component to creating the desired feel and flow of a landscape. By starting the overhaul of your yard off right, the completed project you envisioned can come together quickly and with much less heartache. First off, let’s talk about softscaping and hardscaping, two important terms in this landscaping process. Softscaping is all the trees, shrubs, plants, and flowers. Hardscaping is the more structural elements like pavers, rocks, and cement. For a great landscaping design, you need both softscaping and hardscaping. So, when we say, trees first before sod, we mean softscaping before hardscaping. Natural before structural. While sod is technically a natural item, think of it more as a permanent element, like you would a patio. If you wanted a patio around a large tree, you wouldn’t build the patio first then cut a whole and plant a tree in the middle. No. You would plant the tree first then build the patio around it. That is what it is like with sod and trees. There will be more work and potential heartaches if you lay sod down then decide to add trees and plants. If the sod goes down first, you will have to dig up portions where you want the tree, potentially damaging surrounding sod. And, if you need a crane or other equipment to bring in a large specimen tree, that could create ruts and more damage to your sod. So, why not bypass all those issues and plant trees first, then lay sod around them. No mess, no stress! 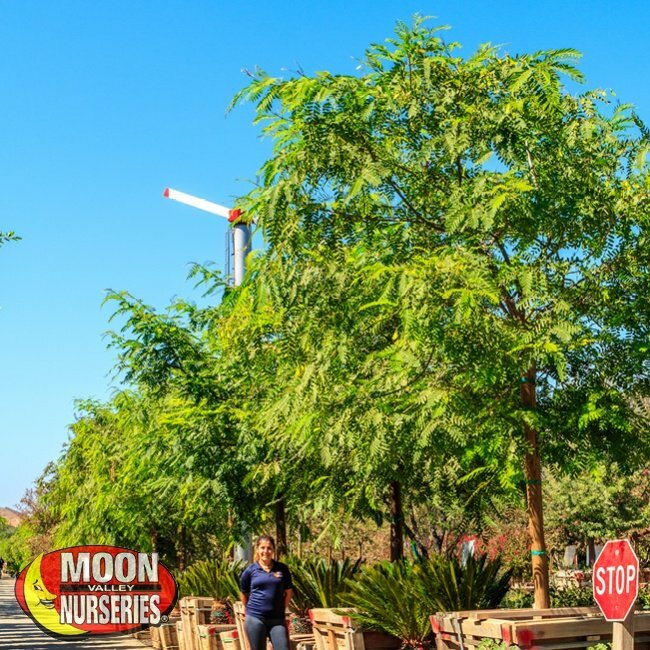 When new trees are planted into your yard, a Moon Valley Nursery professional planting crew will have to create a well around your tree to guarantee healthy growth. Why is that? The reason is because our boxed trees are grown in certain soil that will decompose after some time, and the tree will settle down about an inch. The well also helps hold water for the newly planted tree and then backfills the soil naturally. If the well is dug into the sod, there is the great possibility of the sod dying all around the area of the well. But, if the tree was planted first, you can lay the sod all the way up to the well with no dying patches. 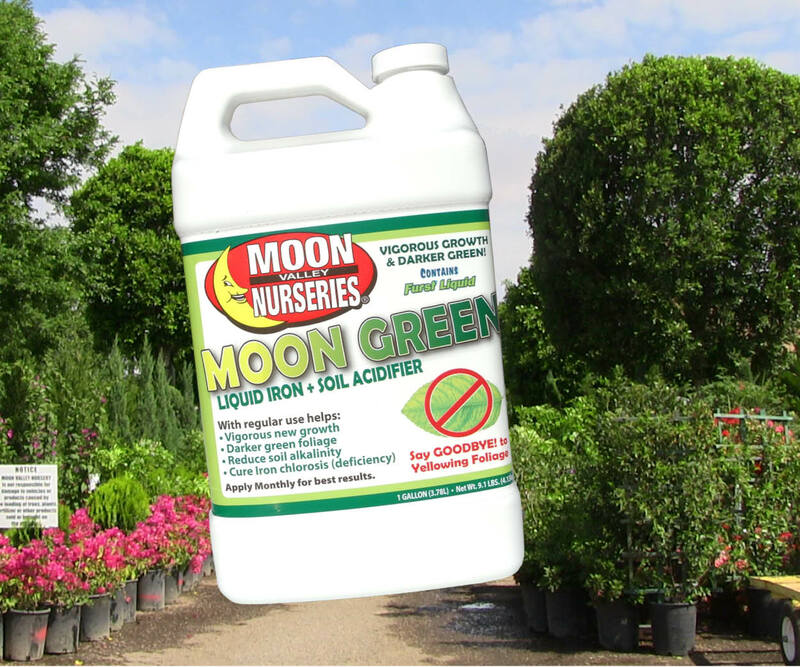 A bonus with planting trees first with Moon Valley Nurseries, you can get our Soil & Water Conditioner to help prep the soil for sod. 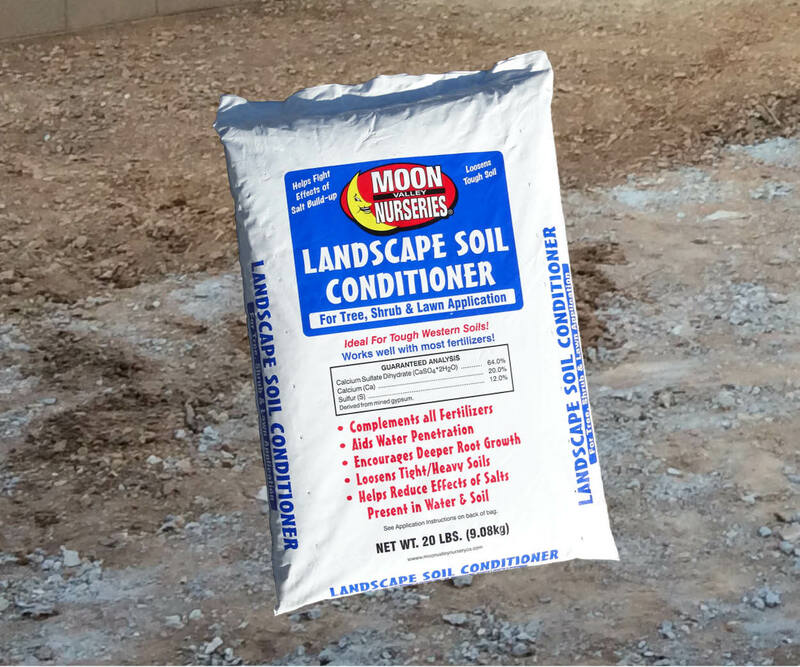 The fertilizer will help balance out the salt levels and the Ph of the soil. 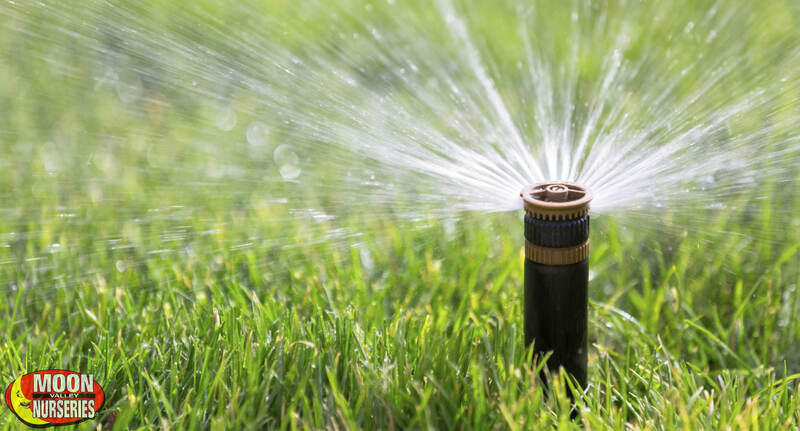 It will make your normal watering and fertilizing of the new sod go further. 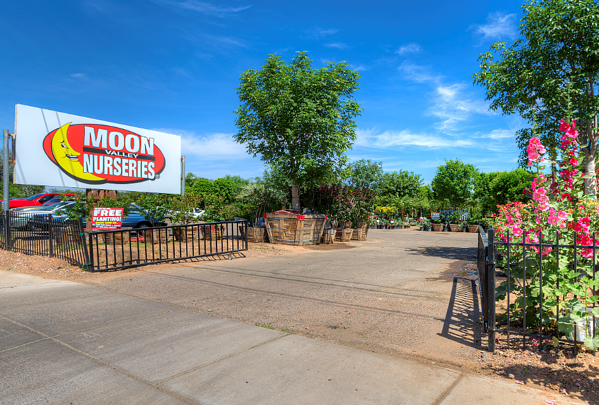 Visit your nearest Moon Valley Nursery location to start your yard revamp off right, with trees first!